Taking Care of Oral Health Crucial to Quality of Life for HIV Positive Patients - Fox Dental, Ltd. In the early Eighties, dentists began noticing symptoms among a few patients that indicated something far more serious. They were, in fact, among the first healthcare providers to recognize what we now know as HIV-AIDS. Today, about 1.2 million Americans have contracted the Human Immunodeficiency Virus (HIV). It’s a retrovirus, somewhat different than other viruses: it can invade immune system cells and hijack their replication mechanism to reproduce itself. Untreated it eventually destroys these cells to give rise to the more serious, life-threatening disease Acquired Immunodeficiency Syndrome (AIDS). Thanks to antiretroviral drugs, most HIV positive patients live somewhat normal lives and avoid the more serious Acquired Immunodeficiency Syndrome (AIDS). But while antiretroviral therapy effectively inhibits the action of the virus, it isn’t a cure — the virus is a permanent resident of the body and can still affect health, especially in the mouth. In this regard, one of the more common conditions associated with HIV is Candidiasis, a fungal infection also known as thrush, which causes cracking of the mouth corners and lesions or white patches on the surface of the tongue or roof of the mouth. HIV patients may also experience limited saliva flow that causes dry mouth (xerostomia) with effects that range from bad breath to a higher risk of tooth decay. The most serious effect, though, of HIV on oral health is the body’s lower resistance to fight periodontal (gum) disease. HIV patients are especially susceptible to a severe form known as Necrotizing Ulcerative Periodontitis (NUP), a sign as well of immune system deterioration and the beginning of AIDS. This painful condition causes gum ulcerations, extensive bleeding, and the rapid deterioration of gum attachment to teeth. 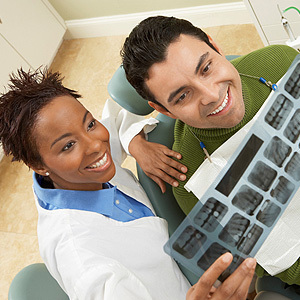 If you or a family member is HIV positive, you’ll need to pay close attention to oral health. Besides diligent brushing and flossing, you or they should also regularly visit the dentist. These visits not only provide diagnosis and treatment of dental problems, they’re also an important monitoring point for gauging the extent of the HIV infection. Taking care of dental problems will also ease some of the discomfort associated with HIV. Thanks to proper oral care, you or someone you love can experience a higher quality of life. If you would like more information on oral and dental health for patients with HIV, please contact us or schedule an appointment for a consultation.